The Coach House/Stables that are available for rental (self catering) and are part of Mildmay House, this property is one of the most beautiful in the area. Easy access to Twyford & Winchester and surrounding area. Great for holiday site seeing, walks, fishing, & golf. The property is within a 45 - 55 minute walk along the River Itchen into the centre of Winchester passing St Catherines Hill & Winchester College en route. Matt and Kate White live at this address with their two young children Jack & Harry, and black labrador Lola - all of us are very friendly and look forward to welcoming you. We bought our house together with our converted stables/coach house, as this is a stunning period property in a superb village location on the edge of the beautiful and historic City of Winchester. 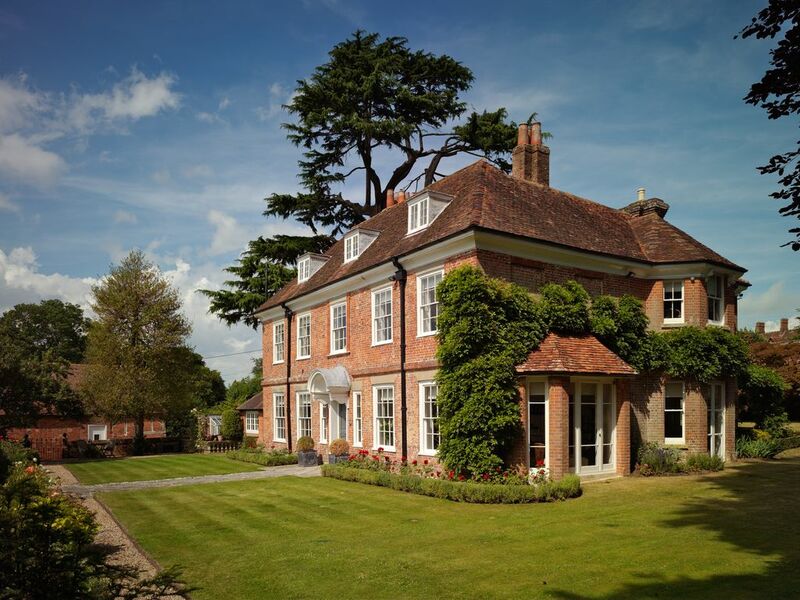 Mildmay House was formerly the Vicarage in Twyford and has stunning views of the Church and water meadows beyond. The property is in a quiet location and a short stroll from the Village shop, post office and pubs, and there is very easy access to hustle and bustle of Winchester. Having a car is not necessary as bus and train are easy walking distance. Separate bathroom right next to bedroom complete with basin, wc, bath with shower and heated towel rail. Tiled floor and walls. All newly refurbished. 3 number decorative (non functioning) fireplaces. Living Room is on the first floor. This is complete with sofa & 3no chairs, side table, area rug, 34" flat screen TV player, daylight blinds at angled roof windows. Gallery kitchen with sink/drainer, fridge/small freezer, cooker & hob, extract, microwave. Tiled floor and walls, spotlights, ample worktops/cupboards and cutlery/crockery/utensils for four persons provided. Our property has an entry hall that doubles as a dining area for 2-3 persons. A small docking station is provided. There are two outdoor chairs and a table immediately outside the Barn entrance hall in the courtyard drive area. There are a number of excellent golf courses within three miles, the closest is Compton Golf Course which is less than one mile away. Notes on accommodation: The accommodation is ideally suited to couples or singles, however up to 2no young children can also be accommodated (supplement) Parking is available immediately outside the drive where there free parking available for church goes and locals. The White family have a dog that is completely separated from the rental accommodation. Outside: This barn accommodation, apart from table and 2no chairs in courtyard/drive area has no outdoor space allocated to it as the gardens to Mildmay House are for private family use only. However, there is immediate access out to the River Itchen/water meadows, a beautiful picnic area and for kids to run about - all less than 100meters from the barn. Utility Room: There is no utility room however there is a washer/drier available for use with a clothes horse. Cleaning / Towels / Linen / Maid service: All bedding & towels are provided. Cleaned on departure. Other: The small entry hall doubles as an informal breakfast area. Relaxing space, local to a number of activities. We would definitely go again. 5 star rating is well deserved. Beautiful property. Clean, well equipped. Lovely location, quiet yet within easy reach of Winchester and the M3 for longer excursions. The property is a stunning barn conversion, fully equipped, clean and full of character. We cannot speak highly enough. I throughly enjoyed my stay in Kate and Matt's converted stable. It is very cosy and homely decorated. The hosts helped with any question I had; Kate and Matt are super hosts! The stable is located in a small village close to a river and walking tracks. Winchester and Southampton are both continently close to the village and the Southampton Airport just 15 minutes away. This is a place I would go back to myself! A beautiful barn converted cottage for two. Ideally placed opposite the church. Well equipped, everything you need for a fortnight stay. Kate and Matt very helpful but only there when you need them. The property is perfectly located for visiting many attractions in the South of England. These include the beautiful and historic cities of Winchester & Salisbury and Portsmouth. In addition to this there is easy driving access to The New Forest, South Downs and The Isle of White. There are excellent walks, cycling pathways and many golf courses. There is a scenic riverside (Itchen) walk from Mildmay House into Winchester - this is 3.3miles and takes approx 1 hour. Driving (within 20-25 min. drive) to the south coast. Very easy public transport options as follows. Ten min walk across watermeadows to Shawford train station. Shawford direct train line to Southampton, Poole & Bournmouth. Twyford Pubs (The Phoenix & The Bugle) under one mile. There are 2no pubs in Twyford within walking distance and both serve food. There is also a cafe/restaurant in Twyford by the post office. Twyford to Winchester is a short drive or taxi journey - (or a beautiful 3-4mile walk along the River Itchen). Booking Notes: 50% payable on confirmation and remainder on arrival. Minimum booking is for two nights. Changeover Day: Check in after 2.30pm/Check out at midday. We can be flexible with changeover day. Notes on prices: Reductions on weekly bookings available.